Easy Start, Easy Stop: allows the user to save time by starting the engine while standing behind the mower; the flywheel brake safety system stops the engine and blades when the user lets go of the brake lever on the handle. Commercial Grade Power: The fuel-efficient Honda GXV160 commercial engine is the source of powerful, quiet operation. Superior Cutting: The exclusive Honda MicroCut® Twin Blade System offers four cutting surfaces to produce finer clippings; the mower can be adjusted to eight heights suitable to all types of grass and mowing conditions. Commercial Grade Design: a rugged 21-inch steel deck with front axle and bumper protection for additional structural stability and durability, along with ergonomic, heavy-duty steel piped reinforced handles. 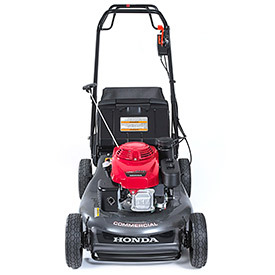 More information about the Honda HRC216K3HDA is available at powerequipment.honda.com.